The 2cm Flak 30 was the primary anti-aircraft gun of the German Army from 1935, before the appearance of the Flak 38. Unlike the Flak 38, which is produced in styrene by almost every company, the Flak 30 was available only from ESCI/Italeri (developed in the middle of 1970s). This new release from Cyberhobby is definitely a big step forward from the ESCI offering, but as any other plastic model kit it is, unfortunately, not ideal. The kit comes in a cardboard end opening box with a typical Cyberhobby artwork on top (side view of the gun) and the kit features printed on the rear and sides. Inside there is 1 grey styrene sprue with 84 parts, 1 PE fret with 6 parts and a 4-page instruction guide. The quality of the parts and molding are very good and comparable to recent Dragon Model offerings. 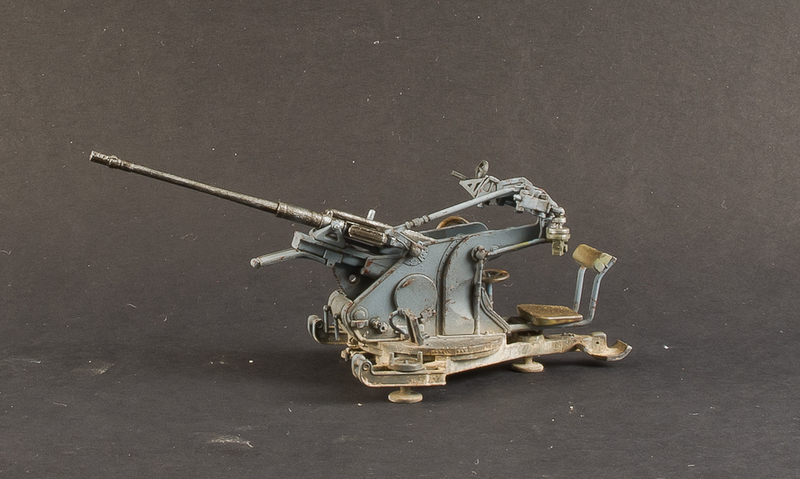 The triangular base-plate gun platform comes as one-piece thus eliminating the option to traverse the gun. The platform has nice detail with tread pattern. Separate parts include the trailer mounting arms, leveling pads with hand-wheels, gunner’s foot pedals and foot rests with tread pattern. To increase the detail a little bit there are several etched parts on the rim of the platform. Note that there are wrong part numbers called out for in the instructions(A65 should be A70, A49 should be A50). The gun sight included is Linealvisier 21 and it is made up of 14 parts in total. Some of them are relatively thick and I hope there will be a resin or PE replacement available in the future. The crosshair is available in two variants – styrene and PE, and here the PE is an obvious choice. The instructions are very confusing since part A19 is not mentioned at all, but it is present on the drawings (see review images for assembly). Overall, this is the most difficult part of the assembly due to small parts and tight fit. The 2cm gun barrel comes as one piece and has a hollow muzzle brake. Receiver, handles and an ammo magazine come as separate parts. As an option there is a PE part for the magazine mounting well if you want to show it open or increase the detail. The gun cradle builds without a problem, just be sure to fill the 2 pin marks on the elevation ark. The two separate side parts have fine detail and there are several parts to glue here. After the side panels’ assembly, the gun with the cradle is put in between and everything is glued to the base platform. The connection of the gun sight to part A27 on the left side panel is very tight and I simply cut one of the location pins on part A52. Due to the inability of the linkage arm to move afterwards you need to define the gun’s angle in advance. Several other parts are added here – front and rear plate, traverse hand wheel and a gunner’s seat. The seat has no location mark and I used the backside of the box as guidelines for the assembly (not only for the seat actually). Finally, there is a travel lock that can be glued in either combat or travel position. No markings are included and there is only one painting variant – overall panzergrey at Eastern front in 1940 (where was that?!). Otherwise, since the gun was used from 1935 you can paint it in Reichswehr 3-tone camouflage or early war two-tone camouflage. This is a nice small kit of the Flak 30 AA gun that can be finished within 1 day (I spent 2.5 hours on the build and review images). The model has nice detail and it is a big step forward from ESCI/Italeri but it is not ideal since it is not possible to elevate or traverse the model. The frustrating part, in my opinion, is the instructions errors. They have nothing to do with the accuracy or feasibility of the model, but with the comfort of the modeller. I don’t understand why the leader of the market (at least for Axis subjects) can’t hire someone who would do a build up and control the parts numbers and instruction drawings before the kit is actually released. It doesn’t take much time and I am sure there are a lot of people willing to do such a job (including me). Highs: Finally an up-to-date model of the Flak 30. Lows: No traverse or elevation, no trailer. Instruction errors. Bob, I am glad that you like the review and most importantly give feedback. Thanks. I am sure they will use the molds for many models but then they won't fix the traverse I guess.